Will you have a 5th grader soon? 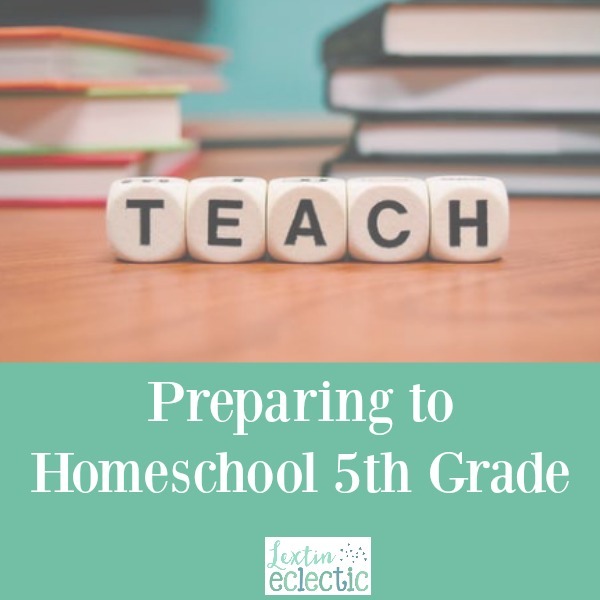 I was initially intimidated at the thought of homeschooling 5th grade. It’s only one year away from middle school! That seemed so scary and overwhelming. Have you ever glanced into your homeschool future and gotten a little weak in the knees at the huge responsibility of directing your child’s education? For some reason, when I thought about middle school I panicked a little bit. Preparing for middle school seemed like an impossible task. I wasn’t quite sure where we should focus for our last year of elementary school. But having survived our 5th grade year and having begun our first year of middle school, I am here to report that you too can do this! However, I did learn a few things that I think I should share. So, if you’re about to start 5th grade and staring into the future of middle school, I have a few thoughts for you. First, think about some of your overall goals for middle school. I’ll share what some of mine are to get you started as you outline yours. Cultivate a love of learning and teach my child to take ownership of her own education. Focus on learning deeply, fostering curiosity, and asking provoking questions. Strive for independent learning, using checklists and calendars to complete work by all deadlines and in a timely manner. Make time for discussions that center on good character and life skills, finding moments to share my heart and hear her heart. Allow my child to begin making more decisions about her own education as per her interests and passions by bringing her into my homeschool planning sessions. I sat down with my daughter and shared my goals with her. I wanted her to understand that learning is so much more than letters in a grade book or a stack of completed books. I want to encourage her to continually question and search for answers. Learning is a lifetime of curiosity unleashed. Ease into the rhetoric stage by planning some discussions. This is the time to start having your child form opinions and discuss them. Plan strategic discussions and have the child prepare for the discussion times by reading a book or by taking some notes. Your child should come into the discussion with some opinions and some source materials. At this age many kids are able to complete some subjects independently. Find ways that your child can study some subjects independently with online learning, texts with clearly outlined assignments, or with DVD learning. Think about using schedules, planners, and checklists. As your child is learning to work independently, now is the time to help your child discover his or her planning style. Try out various planners and ways of making lists to see what best helps your child stay on track. Teaching basic organizational skills is a must as kids begin to do school work more independently. Include your child in your curriculum selection and planning. While you may have done most of your curriculum selection and planning on your own before, now is the time to start including your child. Meet with your child before each semester and ask his or her opinion of the previous semester. Ask what could be changed or improved. Also ask about topics of interest. Teach your child to take charge of his or her own education by starting to make some decisions about the direction of each school year. It was in the 5th grade year that I had my daughter start taking notes from a book. I gave her a spiral notebook and had her record various facts from different history books. We also used a big textbook for the first time and I had her practice highlighting important facts and taking notes. If you begin teaching note-taking skills using written texts, it will be much easier for your child to take notes from a lecture later. Your child will already be in the habit to look or listen for the main points and jot them down. Think about making a contract with your child. Overall, take time to really listen to your child. Kids at this age are on the verge of becoming adolescents. The way they think is slowly starting to change and the adult they will one day become will occasionally peek out. Take advantage of these moments and encourage your child to share their inner thoughts with you. And know that your child won’t always be logical or even make much sense. Nevertheless, keep listening with encouragement because you’ll begin to see their sense of reasoning and thoughtfulness start to expand in the upcoming years. And take a deep breath! You can do this! I’m finding the middle school years to be challenging but interesting and fun. The topics are so much more engaging for me as I teach (and I learn SO many new things). Also, we have great discussions. My daughter asks thought-provoking questions and adds some really profound ideas to our discussions. Start preparing for middle school with confidence, because these years can be so much fun to teach!